How is Hyperthyroidism usually treated? How has Thyrodsoothe helped others? How do I use ThyroSoothe? How long does a bottle of ThyroSoothe last? Hyperthyroidism is a medical condition in which the thyroid gland produces too much thyroid hormone (called T3 and T4). As the thyroid gland plays a crucial role in regulating metabolism and has effects on nearly all organs in the body, an overactive thyroid can have far reaching effects on health and body functioning. An overactive thyroid can result in the following symptoms. If you feel that these apply to you, please consult your doctor for an assessment. The most common cause of an overactive thyroid is Graves Disease. Graves Disease is an auto-immune illness in which the immune system begins to attack parts of ones own body - in this case the thyroid gland. Other causes of Hyperthyroidism include nodules on the thyroid gland, inflammation of the thyroid (thyroiditis) and over-treatment of hypothyroidism (underactive thyroid). Hyperthyroidism may be treated with anti-thyroid drugs like methimazole and propylthiouracil (PTU) - which block the thyroid from producing thyroid hormone. Although these drugs may quickly bring the thyroid into balance, they can have side effects such as itching, rash, fever, liver inflammation or a deficiency of white blood cells. Often the hyperthyroidism comes back after these drugs are discontinued. For this reason, orthodox medicine often recommends that the thyroid be permanently put out of action by means of radioactive iodine treatment or surgical removal of all or part of the thyroid. While this can permanently solve the problem of hyperthyroidism, an unwanted side effect is often symptoms related to hypothyroidism. People who have had their thyroid gland removed or inactivated by radioactive iodine treatment usually have to take medication for hypothyroidism for the rest of their lives. Other medication, for example beta-blockers, may be prescribed to control some of the symptoms of hyperthyroidism. If left untreated, hyperthyroidism can be a significant threat to health and may cause serious complications. Mild hyperthyroidism often responds well to complimentary medicine and a holistic approach (including diet) and may help to calm down the thyroid and remove the need for radioactive iodine treatment or surgery. This should be discussed with your doctor, homeopath or naturopath before home treatment of overactive thyroid is begun. ThyroSoothe is a 100% herbal remedy containing herbs known for their ability to soothe and normalize the overactive thyroid and related symptoms, naturally decrease levels of T4 and TSH and inhibit the binding of antibodies to the thyroid. "This is to let you know that I used Thyrosoothe with my doctor's consent and we have both been very pleased with the results. My thyroid has quietened down and I have no more anxiety and heart palpitations, which were the worst." "ThyroSoothe really helps! I had all the symptoms of overactive thyroid and every single one of them is gone after only 6 weeks of use. I felt calmer right from the beginning." "Two of my friends had to have their thyroid removed because of hyperthyroidism and when I was diagnosed I wanted to avoid this due to the weight gain and other problems. My doctor would not consider a trial and I went for a second opinion and was lucky to get the new doctor to agree to work with me. The results have been excellent and it looks like I will be able to avoid surgery. Thank you so much for this remedy and all of your help!" Lycopus virginicus - also called Bugleweed, helps to normalize the overactive thyroid. Lythospermic and other organic acids found in Bugleweed help to decrease the levels of certain hormones in the body - including TSH (thyroid stimulating hormone produced by the pituitary gland) and T4 (produced by the thyroid). It can also inhibit the binding of antibodies to the thyroid gland, helping to relieve the symptoms of Grave's Disease. Melissa officinalis - also called lemon balm, is well-known for its soothing and calming properties and is widely prescribed by herbalists for the relief of anxiety and insomnia. Some studies have also suggested that Melissa also helps to soothe the overactive thyroid gland, particularly in the case of Grave's Disease. This herb may help to block the attachment of antibodies to the thyroid cells, as well as preventing TSH from stimulating the overactive thyroid. Leonurus cardica - also called Motherwort has traditionally been used to soothe heart palpitations as well as menstrual irregularity and anxiety, making it an excellent addition to this remedy. ThyroSoothe contains no animal products, gluten, artificial flavours, colours or preservatives. 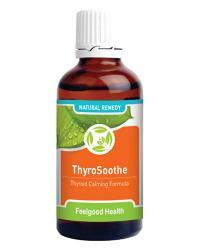 ThyroSoothe comes in convenient tincture form and is diluted in water or juice. Please note that home treatment of severe hyperthyroidism or Grave's Disease is not recommended. Please ask your doctor or homeopath to monitor thyroid functioning to prevent complications. Dilute 15 drops in about 1/4 cup water or juice three times daily. Caution: Not recommended for hypothyroid conditions. Do not combine with other thyroid medication unless under medical supervision. Safety during pregnancy and breastfeeding has not been established. May be used together with PureCalm for additional calming effects - especially in the case of anxiety related to hyperthyroidism. One bottle of ThyroSoothe should last 3 - 4 weeks.